So you’ve decided to go into the cannabis business. If you’re operating in Canada, the medical marijuana business infrastructure is mature. (Medical marijuana usage was legalized across all Canadian provinces and territories in 2001.) What’s more, the government just announced that it will legalize recreational use nationally by Canada Day 2018. Business is booming. With Canadian federal recreational use regulations rolling out in 2017 — and the sale of medical marijuana now considered legal in 28 U.S. States and the District of Columbia — watch for solid market growth in an already large North American market. Note the use of “considered” above. Voters in 28 states have approved initiatives legalizing medical marijuana. But appropriate statutes are not on the books. Yet. Some are still under debate and many in the U.S. won’t go into effect until 2018. Health Canada’s recreational use regulatory framework is currently under development. Thus, the market is changing rapidly — even exploding in some areas as new merchants try to get ahead of regulations and any new licensing requirements. One reality a new cannabis business merchant faces is that banks and other service providers often consider cannabis businesses to be high risk. Naturally risk-averse, banks operating in the United States and Canada are federally regulated. 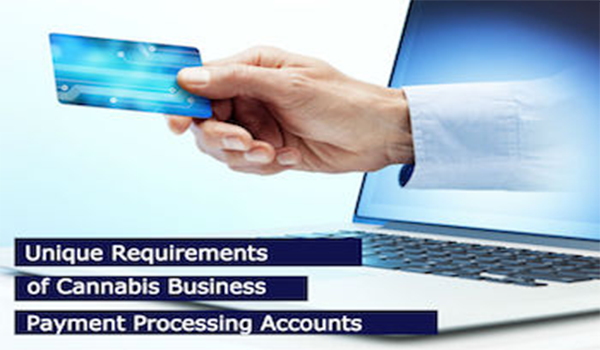 Many banks are concerned about facilitating payments in the cannabis space, which can make it difficult to be approved for a cannabis merchant account. Other challenges for cannabis businesses fall into the “which comes first?” school of thought. Businesses need a banking relationship to operate; yet to establish one, banks want to see records of a healthy business. That can feel like quite the quandary. Much like when applying for a personal loan or mortgage, expect your business life to be scrutinized. Put in place the important business practices banks want to see using these 5 tips. A good business plan provides the basis for the following results. A healthy processing history. A track record of at least six months of operations is best. Good records are needed, and all facets of the business will be explored. Ideally, processing results tie to the business plan. Strong financials. A business bank account with a healthy balance is important. Funds may be self-generated or the proceeds of a loan, if you qualify for one. Therein lies another challenge. When a merchant is considered high risk, it’s difficult — if not impossible — to be approved for funding from a bank. Professional operating controls: A strong business includes key recurring processes and controls. Internal controls systems address financials, inventory, security (think PCI compliance); ongoing reporting for financials and inventory. Provide evidence that the Key Business Processes outlined in the plan are operating well. Excellent customer communication… Send email confirmations of orders and shipments. Ensure timely shipment, and require signatures on all packages sent to customers. Make sure your billing descriptor is recognizable. Use your business name. Have a robust, recurring process to screen your payment gateway for fraudulent transactions. As new regulations and restrictions come online in the U.S. and Canada, take them on board and adjust your business operations. Working with a payment-processing partner who specializes in high-risk merchants should be at the top of your to-do list. Those who specialize are experts not only in the complexities of the payments processing industry in your country, but also in the unique challenges facing high-risk cannabis business merchants. They’ll help you land the right merchant account and find the right secure payments gateway. An experienced merchant services provider will work with you to understand your specific business model and goals. They’ll tailor a solution to meet your payments needs so you can focus on your core business.